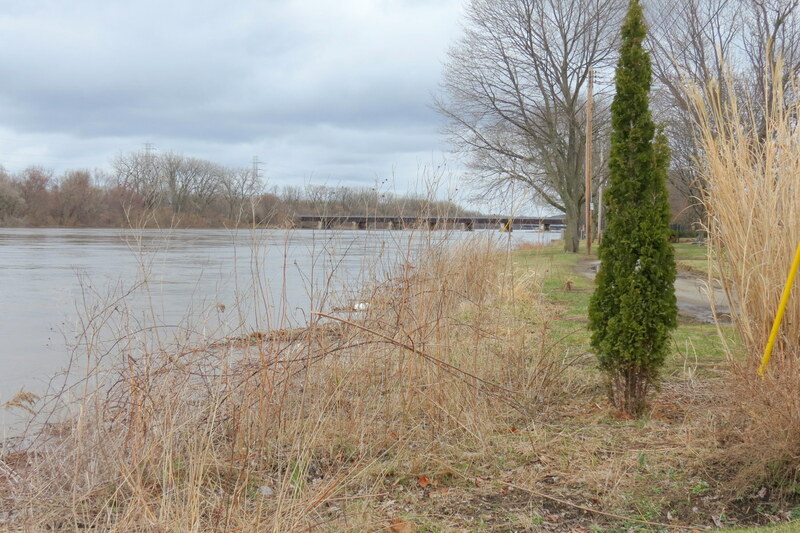 I will be posting photos in this webpost from Riverside Park, along the Mohawk, including the water gauge at the Park’s esplanade (near N. Ferry Street and the Pump House) and, if appropriate, from Cucumber Alley. 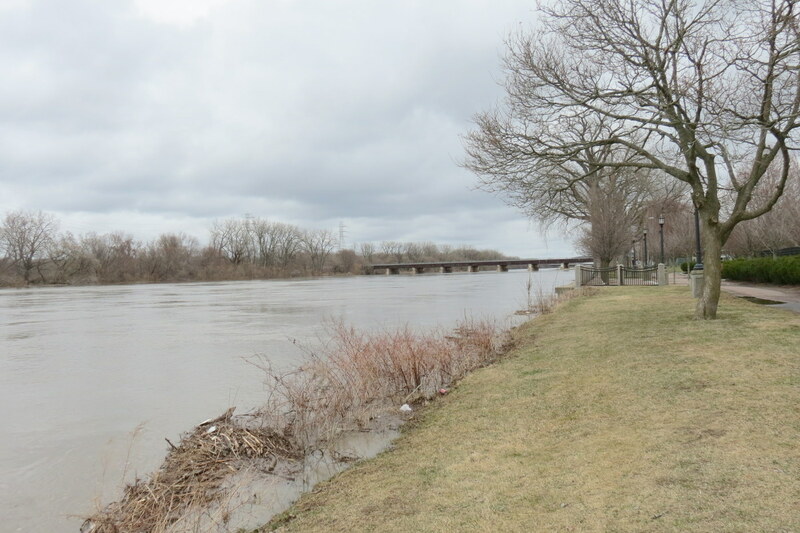 The River photograph above is a shot of the esplanade and water gauge at noon today (Wednesday). 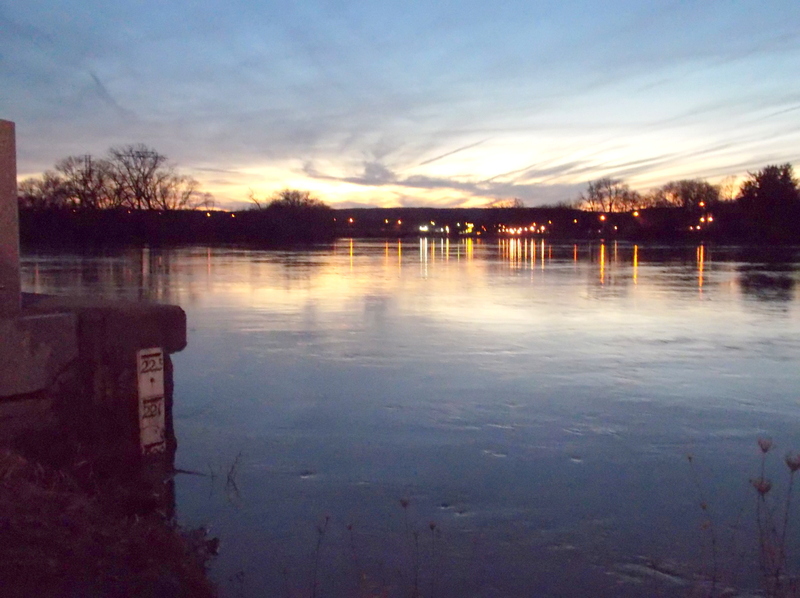 It is at the 221′ level, three feet higher than at 6 PM yesterday evening. 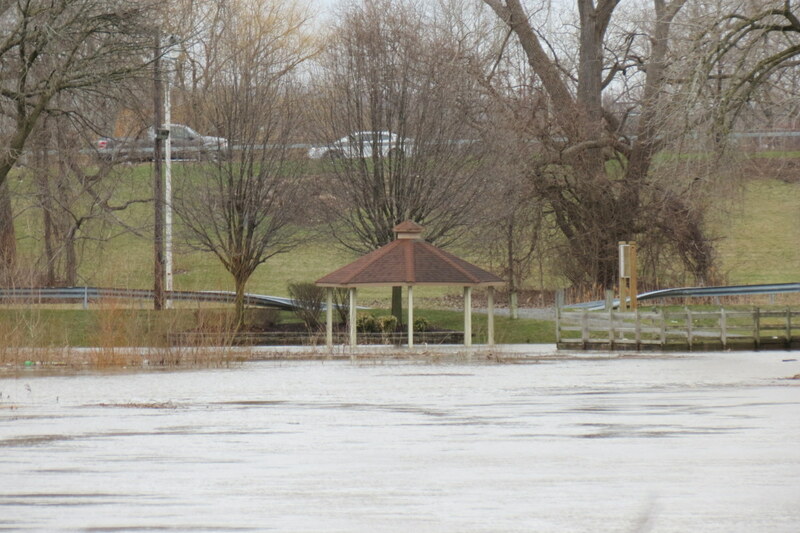 The water is not yet over the banks at the Park. 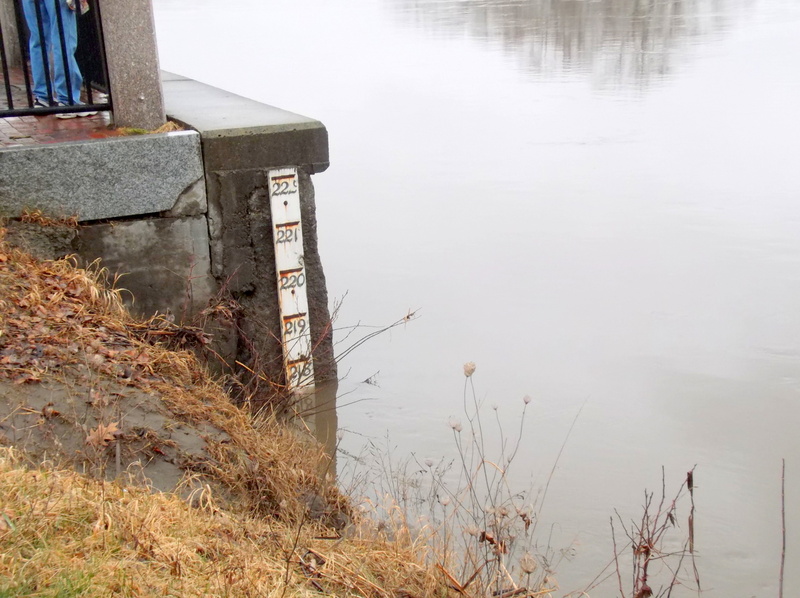 The Weather Service shows the water levels for Schenectady, which are actually measured at Freeman’s Bridge, at around 218 feet this afternoon, and expecting to decline the rest of the day, before inching up a bit due to heavy rains tomorrow. . . above: looking west from the Esplanade, noon, Wednesday . . 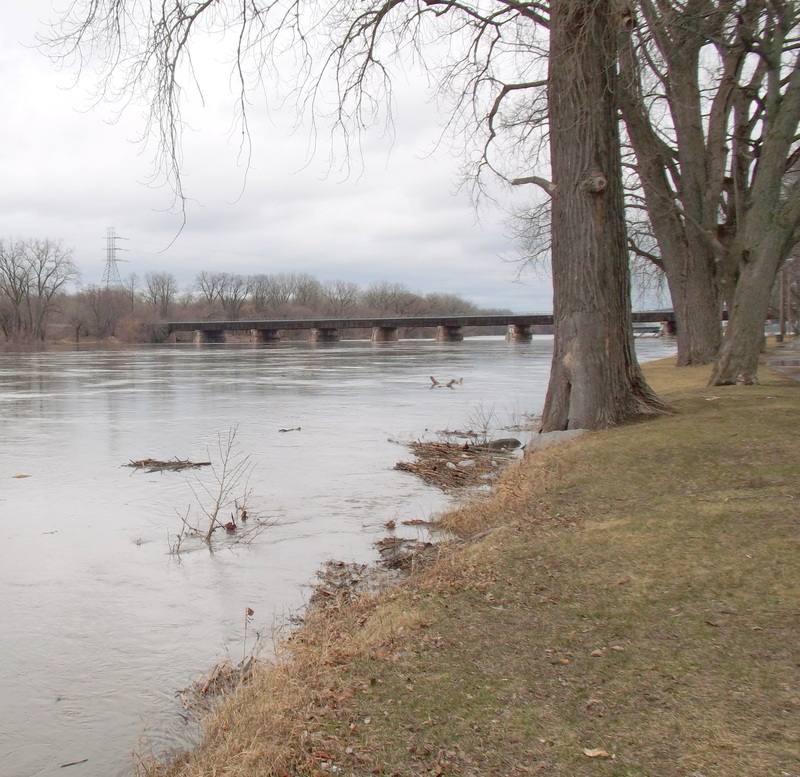 This 39-second video clip give you an idea of how fast the water is flowing in the Mohawk. 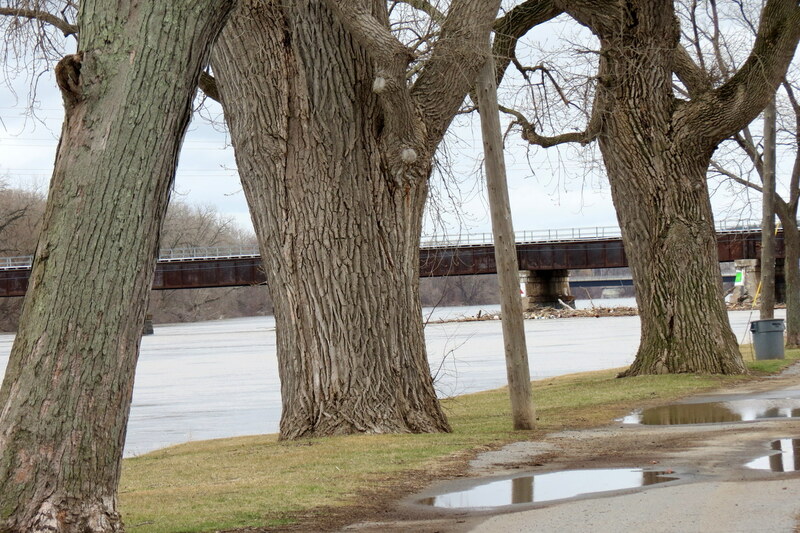 There have been many large tree branches in the River the past few days. 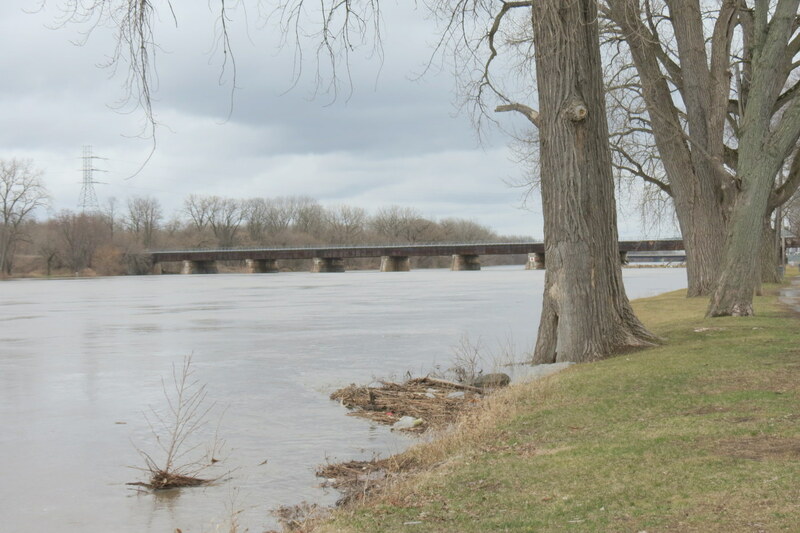 This photo was taken looking east from the Esplanade toward the CSX train trestle, at about noon, Wednesday, April 5.
more photos will be posted here over the next couple of days, as we continue to watch the Mohawk. 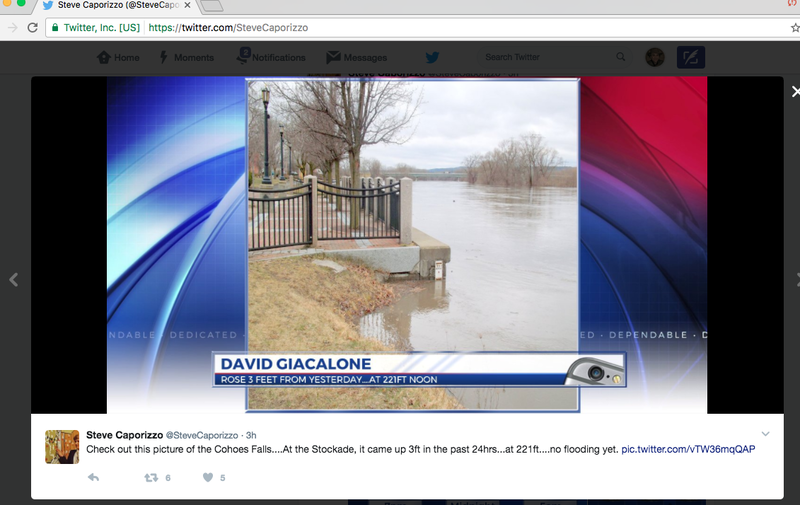 . . and, thank you, Steve Caporizzo, for using my noon photo at the Esplanade on the Channel 10, WTEN, 5 PM newscast, and also tweeting it. 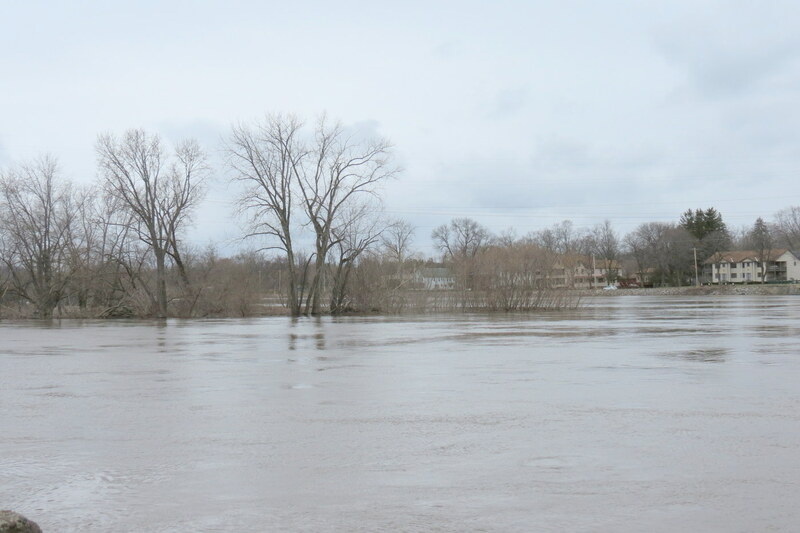 . . update (Thursday, April 6, 2017): The water continues to come down (gauge shows the level just above 217 ‘), but heavy rains will surely mean an uptick tonight. 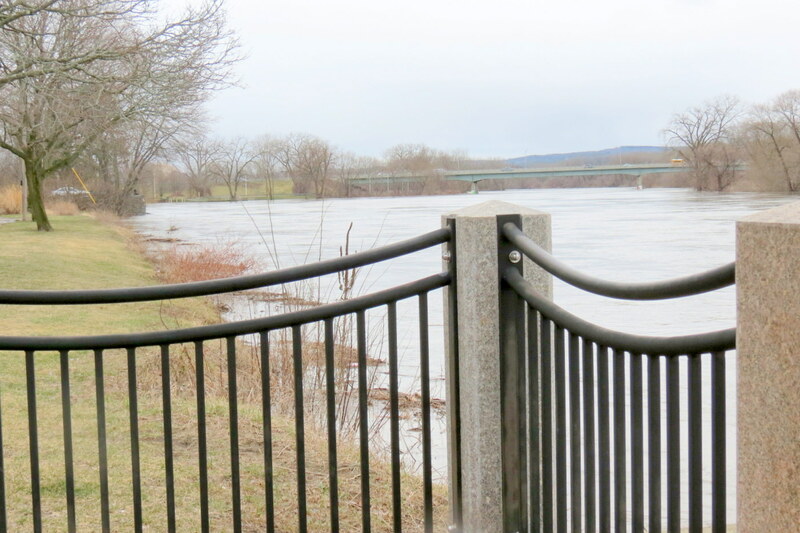 It is a bit confusing that the Weather Service measures Schenectady Mohawk River levels at Freeman’s Bridge. 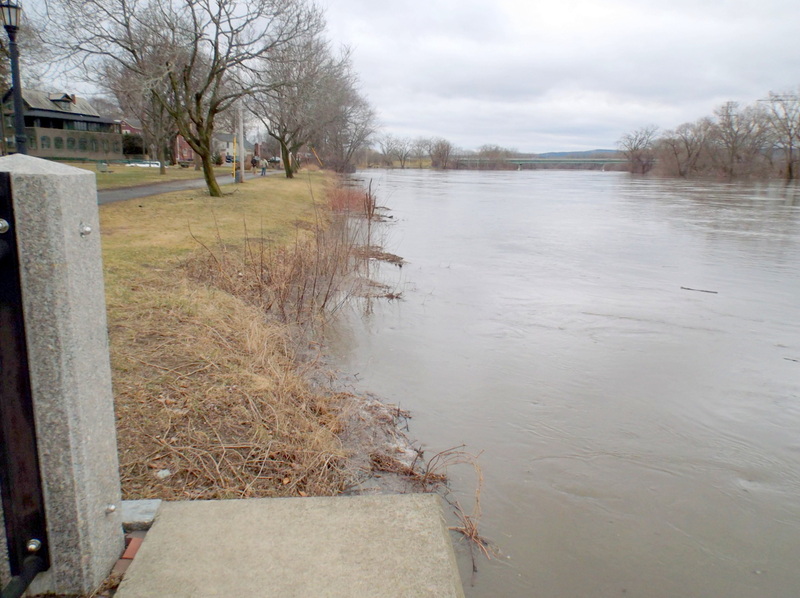 Those levels tend to be 3 to 4 inches lower than along Riverside Park at the Stockade. 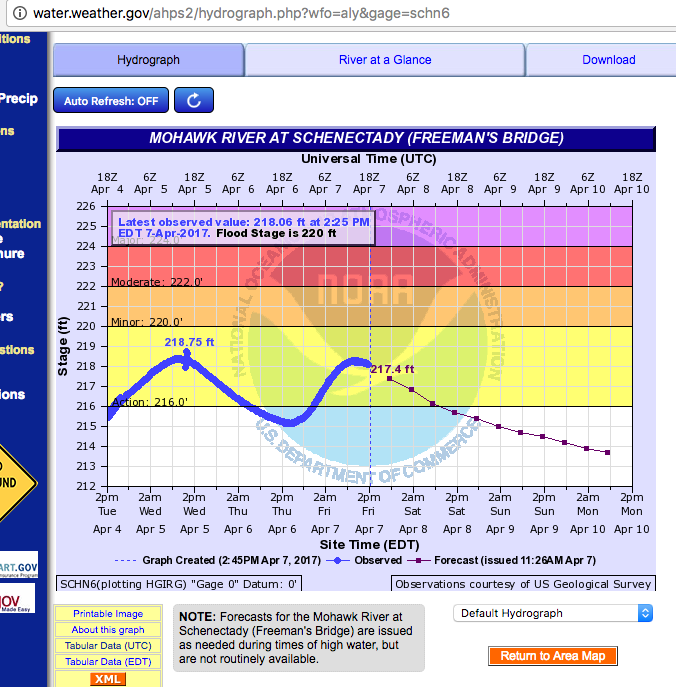 The graph to the left, created at 2:45 pm, Friday, shows water levels at over 217 feet and falling since about 11 AM, with the trend consistently downward for the next few days. 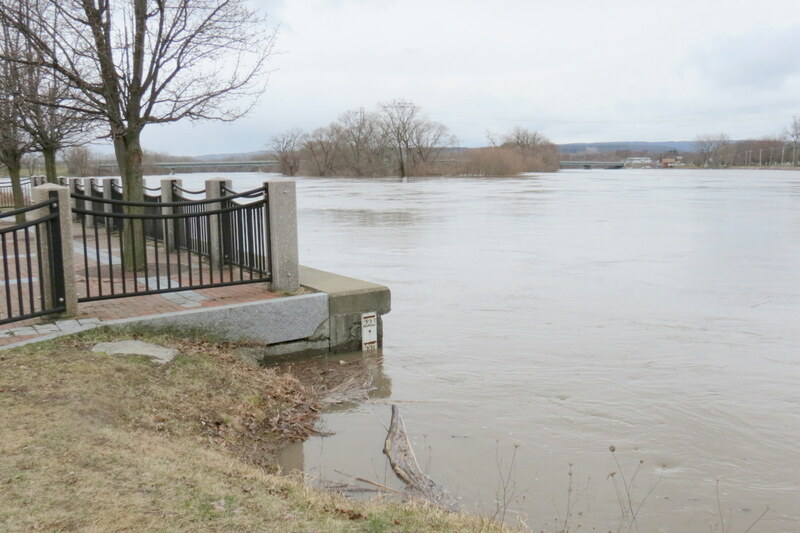 Water levels have probably also been declining at Riverside Park all afternoon. There is no reason to believe they will rise again significantly. 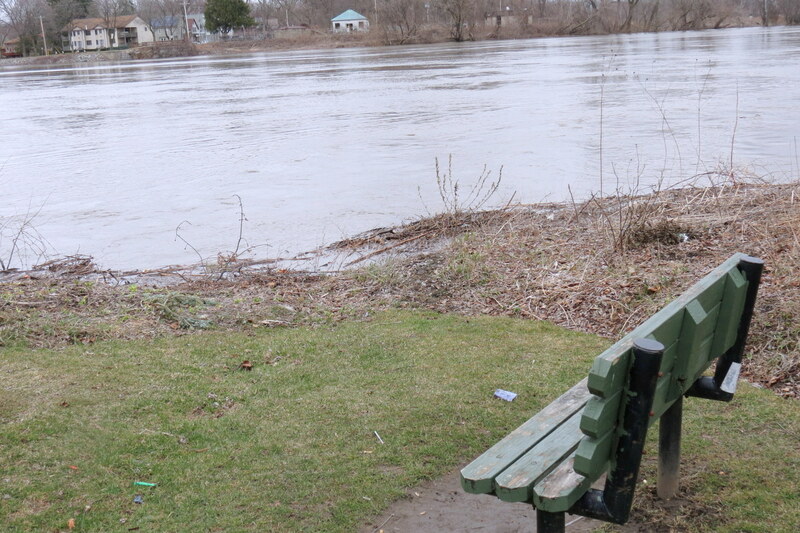 And, so, this is my last Mohawk Watch Report for this high water episode. [L] Isle of the Cayugas seen from Washington Ave. deadMyend. . . . . above: view west from Esplanade . .